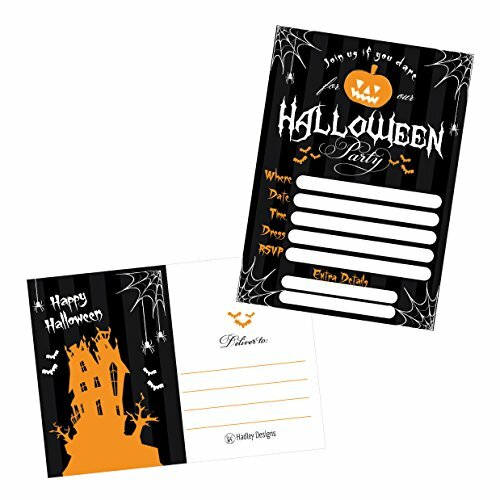 The Halloween invitation cards 60 count set with orange envelopes is ideal to handwrite your event details including recipient, date, time, party venue and RSVP. 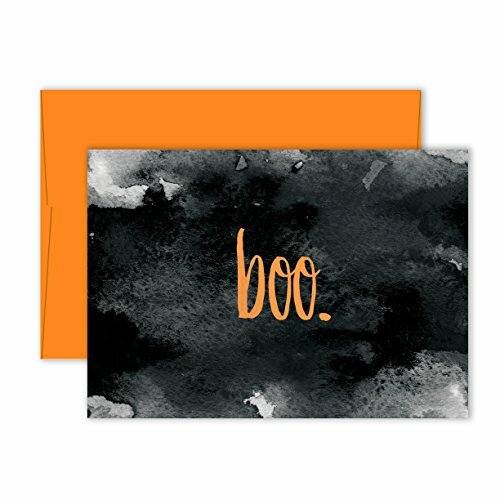 The cute Halloween design is perfect for your Halloween party! Each card is made from high quality paper which is thick, durable, and easy to write on. Hurry up and annouce the upcoming fun party, dinner, or lunch! 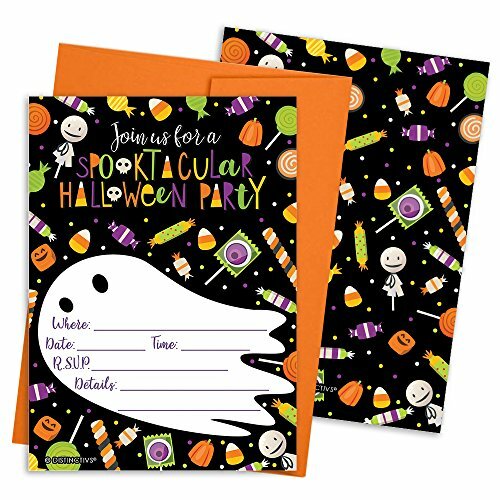 Order includes 12 Fill-In Post-Card Style Spooktacular Halloween Party Invitations with Self-Sealing Bright Orange Envelopes. 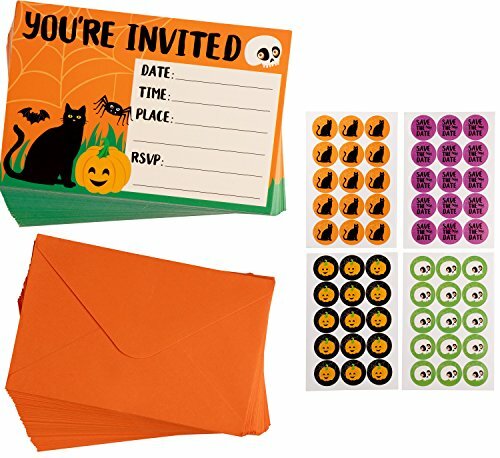 Invitations are 5" x 7" and Feature Cute Halloween Candy Designs on a Black Background. Designs are family friendly, perfect for a kids Halloween party. 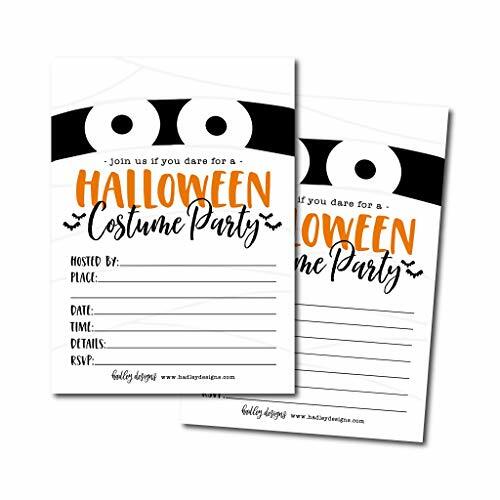 Send specters these Party Ghost Halloween Invitations to let them know about your party! Decorated with bats, stars and floating ghosts, these Halloween party invitations are just what you need to invite guests to a supernatural celebration. There are lines provided inside each card for you to write the date, time, location and RSVP invitation and they even come with envelopes so you can send them by mail. 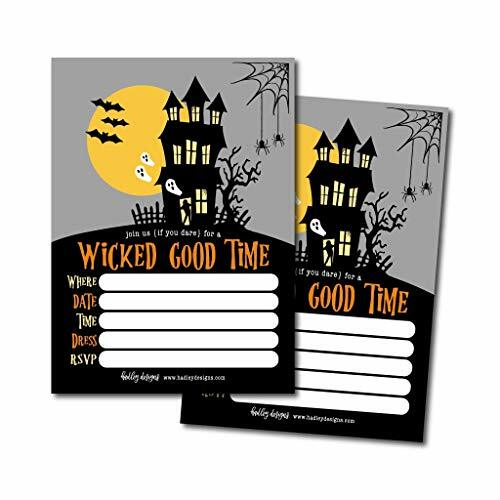 Shop more of our Halloween party supplies to get prepared for a ghoulish good time. Our collection of affordable, customizable designs make it easy to share with family and friends. This Whimsical-inspired Halloween Invitation is available in Lime, Orange & Violet. Our collection of affordable, customizable designs make it easy to share with family and friends. This Whimsical-inspired Halloween Invitation is available in Mint, Orange & Lavender. Our collection of affordable, customizable designs make it easy to share with family and friends. This Whimsical-inspired Halloween Invitation is available in Black, Plum & Tangerine. Our collection of affordable, customizable designs make it easy to share with family and friends. This Whimsical-inspired Halloween Invitation is available in Black, Charcoal & Eggplant. Invite friends and family to your party with a sugar skull party invitations. These fun party invites are printed on sturdy card stock paper and have plenty of space to add the party details. Plus, their unique shape will be adored by all your guests. Each set of 12 shaped fill-in invitations also includes 12 white envelopes, making it easy to get your party invitations into the mail. 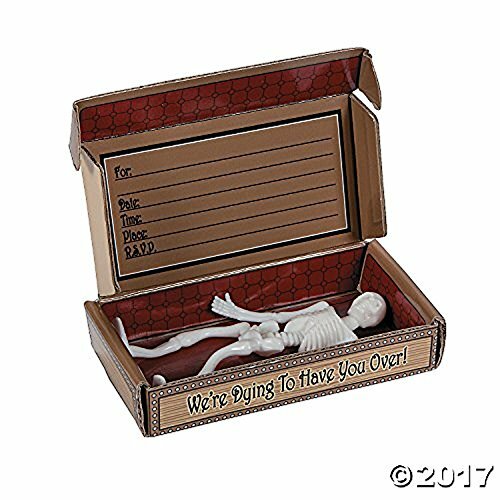 Begin planning the perfect party with these party invites!Day of The Dead party invitations SIZE 5 inches by 7 inches. The included envelopes measure 5 inches by 7 inches. The back of each Day of The Dead party invitation has space to add your party details: For: Date: Time: Place: Given By: RSVP: PREMIUM PARTY INVITATIONS: Halloween party invitations are professionally printed on heavy-duty card stock paper with a photo-like shine.They are individually inspected, then carefully packaged with our exclusive squiggle flap envelopes, making this Day of The Dead stationary set a must-have for any Halloween party. MADE IN THE USA: Day of The Dead - Halloween Sugar Skull Party Shaped Invitations are designed and manufactured at our Wisconsin facility using materials that are Made in the USA. Witches and warlocks will all jump for joy when they receive these Trick or Treat Halloween Invitations. Featuring a spooky witch and a small black bat, these party invitations have just the style to fit your spooky celebration. Use the lines provided inside to fill out the date, time and location, then use the included envelopes to mail them out. 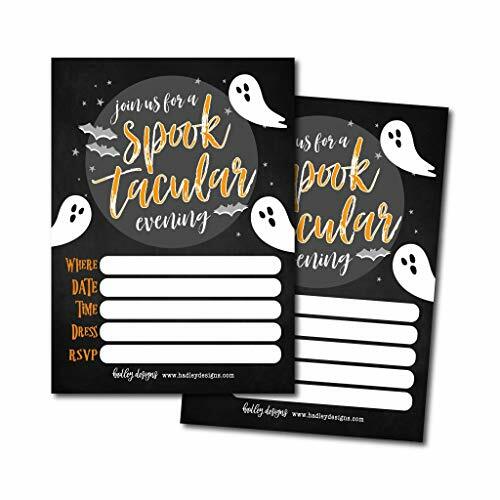 These invitation cards will be a scary surprise for all your guests and they're a great way to let everyone know when to break out their broomsticks and fly to your party. Looking for more frightening fun? Shop our other Halloween party supplies! Halloween Jar Halloween Letter Papers- 25 Sheets of of Halloween Letter Papers, Newsletter, Announcement, and Invitation - Transform any newsletter, announcement, or invitation text into your own unique creation by printing it on our¬†Halloween Letter Papers.¬† Our Letter Papers are colorful, one-sided sheets that measure 8-1/2" x 11"the same size as copier paper and easy to print with almost any computer and printer. The paper is 28-lb. bond, a high-quality stock that's noticeably heavier than the 20-lb. bond weight of most copier papers. We've pre-printed the design for you in brilliant full color. You'll save money on ink cartridges! Plus, because we can print the designs from edge to edge, your printed documents will look much more professional than those printed from start to finish on a home- or small business-size printer. 25 sheets per pack. Envelopes not included. Put both together, the song change is a tad noticable, if even that. Welcome invitation for our annual Pumpkin carving party. Lots of food and candies and of course pumpkin carving. Please bring a pumpkin to carve! This is a Halloween invitation I shot and edited.